SAN FRANCISCO, CALIFORNIA — SonicCloud announced late last week that it will be launching with more than $4 million dollars to pursue its goal of making hearing technology accessible for people with hearing loss. The SonicCloud App, currently available on iOS (Apple) only, allows people with moderate to severe hearing loss to more clearly hear phone calls, using their own earbuds. Larry Guterman, co-founder of SonicCloud, has dealt with hearing loss for most of his adult life and had experienced frequent feedback issues when using his hearing aids on the phone. After a phone conversation with successful Silicon Valley engineer and co-founder of SonicCloud, Jon Lederman, they concluded that they should build hearing aid functionality right into the phone itself. Using the company’s SonicCloud app, mobile phone calls can be individually calibrated for each person’s hearing needs. With the app, users take a hearing assessment, which allows the app to customize the settings for each ear. This personalized setting is driven by an algorithm in the cloud that then adjusts the sound settings to an individual’s hearing needs. The cloud-based algorithms process speech in real-time for incoming and outgoing calls, helping optimize and improve the listening experience for individual users. 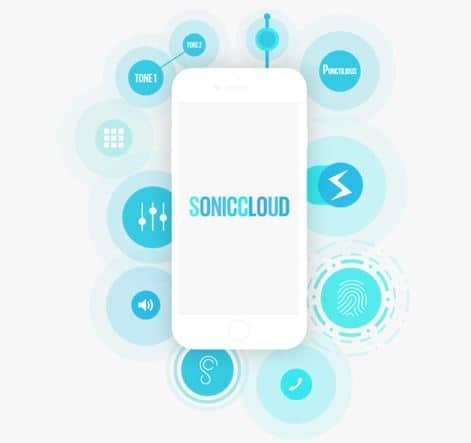 The SonicCloud app can be used with standard earbuds and is free to download. Users pay $9.99 per month to use the cloud calling services for an unlimited number of calls.